In everyday life, three-dimensional perception is of utmost importance for the correct evaluation of the distance, size and shape of a given object. Three-dimensional perception relies in our ability to interpret parallax, which in turn derives from the binocular, i.e. stereoscopic viewing capability, that we acquired throughout evolution. Under normal conditions, visual information outputs simultaneously from both eyes. Although our left- and right-eye fields-of-view overlap considerably, they produce quite distinct images. Specifically, a nearby target will project itself differently against background objects when it is observed through the left versus right eye. Our brain is able to interpret these differences, that is parallax, and to automatically translate them as depth-of-field data. Such ability is greatly impaired when we just analyze two-dimensional renderings of our three-dimensional environment, namely photographs, CCD images, time-lapse animations or even real-time movies. Accordingly, as our brain attempts to recover three-dimensional data, it becomes restricted to the interpretation of indirect depth-of-field clues, namely perspective, shading details and superimposition of objects. Furthermore, it has to correlate these clues with any pre-existing information about object size and shape. Fortunately, we can still recover a considerable amount of three-dimensional data from two-dimensional originals through the use of stereoscopic-pairs. For astronomy, as for other purposes, we originate stereoscopic-pairs by combining two distinct images of the same object. 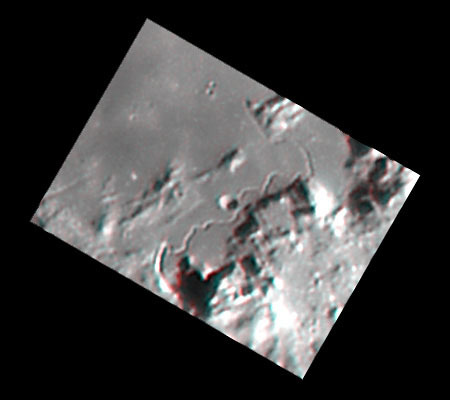 We usually acquire these images simultaneously, using an identical image-scale and field-of-view, but we have to obtain each one of them from a different location. The aim of this procedure is clearly to reproduce the above described parallax effect, albeit at a scale larger than our own inter-pupil distance. In this case, the rule is quite simple: to elicit a parallax effect in progressively remote objects requires progressively larger distances between observation sites. Collaborations involving amateurs living several thousand kilometers apart are thus not exceptional. One example of such collaborations was my participation in the Astronomy On-line trans-European project for the simultaneous observation of the 12 October 1996 Solar Eclipse. However, parallax data is rather difficult to obtain since the odds are often against us regarding simultaneous favorable weather and/or time-zone compatibility with a given event. It is true that there are other ways of obtaining stereoscopic-pairs, though with much more restrict applications. For instance, in the case of non or slowly moving objects those can be produced by sequentially acquiring an image from one site, transferring the telescope and/or camera to a different location and then obtaining the second image while using a similar framing. Although image-synchronization is lost, a fact that in this case may be considered irrelevant, both time-dependent information and spatial data are preserved. Lucky enough, there is a simpler method for obtaining a parallax effect, that is to recover three-dimensional information, from the analysis of two-dimensional renderings of moving objects. It has been extensively used in survey programs, e.g. for searching new comets and asteroids, but it can be easily applied to a wide variety of sky events. The actual procedure is straightforward. Instead of attempting to produce true stereoscopic-pairs, a three-dimensional effect is obtained by combining a set of two images acquired from the same site, with the same instrument and covering similar fields-of-view, but taken at a particular time-lapse from each other. During that time-lapse, a potential asteroid or comet will move with respect to the background star-field. This also applies to other targets. For instance, foreground clouds will move rapidly against the celestial sphere, and a rotating planet will show us a slightly different hemisphere. Those sequentially obtained images are often analyzed with conventional image-blinking devices or software, to emphasize the presence of any moving objects. However, they can also be used to produce Time-Lapse emulated stereoscopic-pairs. Both true and Time-Lapse emulated stereoscopic-pairs can be easily prepared using the red-blue color-coding or the side-by-side alignment methods. In the former method, a RGB image is synthesized by ascribing a previously obtained set of black and white images, i.e. 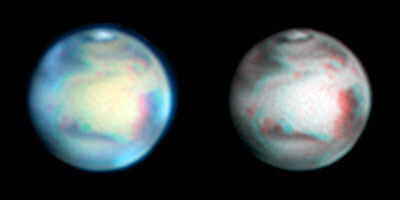 left- and right-side images, to the red- and blue-channel respectively. The image for the blue-channel is also used for the green-channel. The result is a grayscale anaglyph image. This can be readily achieved with image-processing software packages like Adobe PhotoShop or Aldus Photostyler. Such RGB images, that is stereoscopic-pairs, are then observed with colored three-dimensional glasses like those that accompanied one of the Issues of Sky&Telescope and, more recently, Astronomy. These were made up of red and blue cellophane filters for the left and right eyes, respectively. In the latter method we simply align, side-by-side, a set of left- and right-side images that are then observed by voluntarily modifying eye-convergence (parallel viewing) or with the help of a binocular stereoscopic-viewer. For both methods, choosing an adequate image size and obtaining a proper alignment of the resulting stereoscopic-pair are critical steps to obtain a correct three-dimensional perception. First of all, both images should have the same size and orientation. In order to maximize the three-dimensional effect, the object's path should be set horizontally, if necessary by rotating both images but preferentially by correctly orientating the camera before images are obtained. For the same reasons and using similar methods, the rotation axis of planets should be set vertically. Image framing is also important. The non-moving background, or when appropriate the non-moving foreground, should be similarly framed in both images. For rotating planets it is best to maintain a precise alignment of the planetary limb. An error that commonly occurs during the preparation of stereoscopic-pairs is the assignment of the left-side image to the right-side position and vice versa. This will be immediately noticed since it produces a reversed three-dimensional effect, that is the background will appear in front of what should be the foreground object. Additionally, planets will appear hollow and with a concave surface. The optimum time-lapse between left- and right-side images depends of various factors, namely image magnification and speed of movement, and always has to be tested. If an insufficient time-lapse is chosen the three-dimensional effect will be minimum, whereas image merging will become difficult if an excessive value is used. For planets, an additional artifact appears when we chose a higher than desired time-lapse between images, namely a reduction of the planet's equatorial diameter. Also for planets, satellite shadows can be seen artefactually "floating" over the planet's surface when Time-Lapse emulated stereoscopic-pairs are used. While the task of obtaining true stereoscopic-pairs of sky events is in practice difficult to accomplish, I also gave some examples that demonstrate that its Time-Lapse emulated counterparts are easily acquired by amateurs. In short, we only have to obtain a set of two images with the same instrument and at a given time-lapse. Such time-lapse can be highly variable. For fast-moving comets like Hyakutake's, or fast rotating planets like Jupiter, a few minutes are enough. 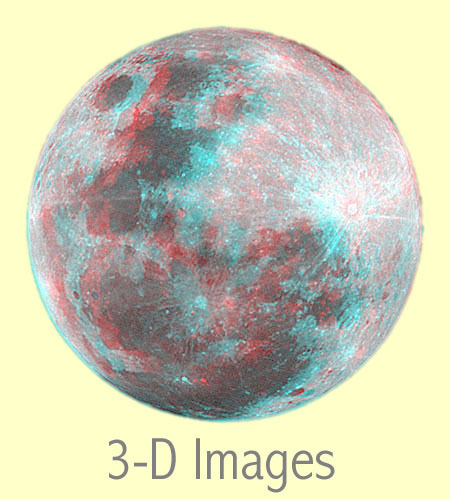 But to produce the desired three-dimensional effect (due to libration) in the full-moon image shown at the top of this page, images were obtained at a 6-month interval (for details see the "QuickCam Astrophotography" section of this page). Considering this background information, the next step in our perpetual quest to duplicate reality will surely be to attempt to produce three-dimensional animations from Time-Lapse emulated stereoscopic-pairs. And this next step is just a small step. I like to call the procedure that readily allows us to prepare such three-dimensional animations the Time-Lapse Parallax Method. For spinning planets it is perhaps better described as Rotational-Parallax Method. Accordingly, it completely relies in a single time-lapse sequence of images to originate the motion effect and to emulate parallax. The actual procedure is quite simple, and it will be straightforward to all astro-directors that have already succeeded in producing movies of cosmic events. All that is required is a two-dimensional time-lapse sequence and some additional image-processing steps. This means that previously obtained two-dimensional animations can easily be re-processed to obtain a three-dimensional effect. To obtain a three-dimensional animation using the Time-Lapse Parallax Method we only have to shift two copies of same two-dimensional time-lapse sequence by a given number of frames. For example, frame no.1 will become aligned with frame no.3, frame no.2 with frame no.4, frame no.3 with frame no.5, and so on. We then combine the newly aligned two-dimensional frames to obtain a sequence of Time-Lapse emulated stereoscopic-pairs. These stereoscopic-pairs are the actual frames we will use to build up our new, that is three-dimensional, animation. Any of the two methods already described, i.e. the red-blue color-coding and the side-by-side alignment, is suitable to prepare such stereoscopic-pairs. Time-Lapse Parallax animations are always shorter than its two-dimensional counterparts. This is due to the shift between two-dimensional sequences, a step that will always leave some of the initial and final frames unpaired, that is unusable. In the hypothetical example above, frames nos.1 and 2 from one of the copies are left unpaired. However, the optimum frame shift depends on various factors, namely the frame-rate of the original animation and the actual speed of the event, and we must always confirm it using representative frames. If we apply an insufficient shift the three-dimensional effect will be minimum, whereas merging of left- and right-eye images will become difficult if we use a higher than desirable value. 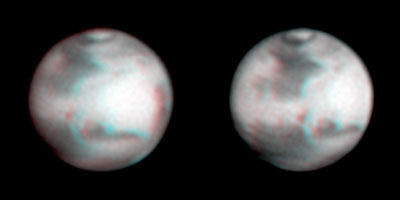 The universe of potential targets for Time-Lapse emulated stereoscopic-pairs and Time-Lapse-Parallax animations involves numerous scenarios, ranging from wide-angle views obtained with fixed cameras to high-resolution planetary images acquired using equatorially-mounted motorized telescopes. Irrespective of such great diversity, one has to remember that what allows the retrieval of three-dimensional information is in all cases target motion. It can be the apparent movement of the celestial sphere, the orbital path of comets, asteroids or satellites, the rotation of planets or even clouds moving in a partially overcast night. While practically all the examples shown were obtained with a refrigerated CCD-camera operating from a light-polluted environment, the approach is by no means restricted to electronic imaging and urban skies. So, next time you travel to your favorite dark site, even just carrying a conventional 35mm photographic camera and a tripod, you will have no more excuses for returning without a three-dimensional souvenir.